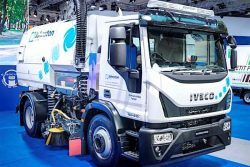 The 2018 International Motor Show Germany (IAA) has started and IVECO is grabbing attention with the presentation of a new sustainable zero-Diesel sweeper on its Diesel-free/Low Emissions Area stand. The new VS651 CNG truck mounted sweeper is based on a 210 hp IVECO Eurocargo Natural Power truck equipped with a sweeper body engineered by Johnston in collaboration with IVECO. It is powered only by CNG (Compressed Natural Gas). At the 67th IAA Commercial Vehicles, in Hannover from September 20 to 27, the zero particulate matter sweeper combines the Eurocargo’s one CNG engine with a hydrostatic transmission developed by Johnston, so that no diesel is used to operate the sweeping equipment. This results in a dramatic reduction in emissions compared to traditional truck-mounted sweepers. This new vehicle addresses the issue frequently found in the transport industry, where a very clean truck is equipped with a body that has a system operated by an additional engine that is less regulated or even unregulated. The three tanks mounted behind the cab hold 420 litres of CNG, enough to complete a full sweeping shift. Leeds City Council in the UK is one of the first local authorities to introduce the latest Johnston VS651 CNG to its fleet, as part of the council’s Clean Air Initiative which aims to have all vehicles on its fleet running on CNG or other alternative fuels by 2020. Urbaser in France has also ordered 26 of the new CNG machines to sweep the City of Paris, in preparation for a ban on diesel vehicles manufactured before 2005 during 2019, with a total ban coming into force in 2024. The order is the largest so far for the new sweeper, and demonstrates the drive towards reducing air pollution in cities all over the world. IVECO is a brand of CNH Industrial N.V. The company designs, manufactures and markets a wide range of light, medium and heavy commercial vehicles, off-road trucks, and vehicles for applications such as off-road missions. The brand’s wide range of products include the Daily, a vehicle that covers the 3.3 – 7.2 ton vehicle weight segment, the Eurocargo from 6 – 19 tons, the Trakker (dedicated to off-road missions) and the Stralis, both over 16 tons. In addition, the IVECO Astra brand builds off-road trucks, rigid and articulated dumpers as well as special vehicles. IVECO is a member of NGVA Europe.